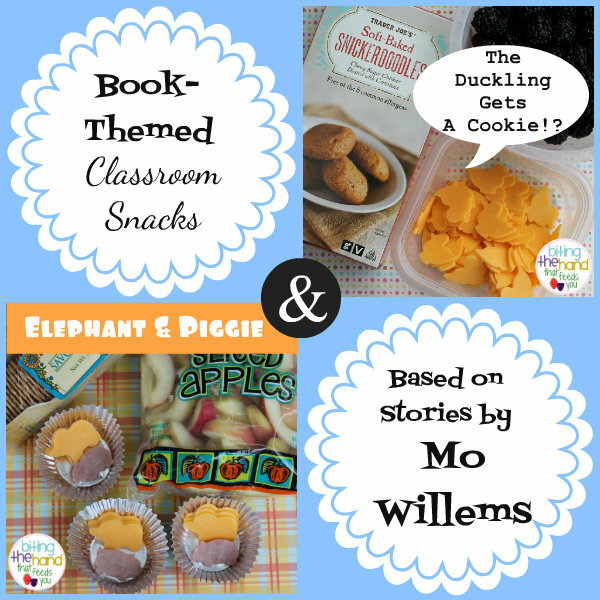 Biting The Hand That Feeds You: Mo Willems Story-Themed Classroom Snacks! 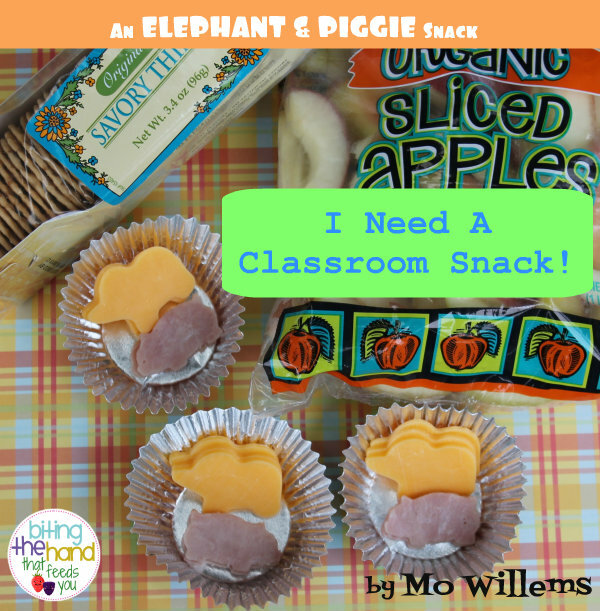 Mo Willems Story-Themed Classroom Snacks! Instead of a Seuss learning unit around his birthday and Read Across America Day, Z's PM preschool teacher did a two-week book-themed unit the first two weeks in March. So at the beginning of the year I made sure to sign up as snack parent for one of those weeks! I like having themes to help inspire me. I was stressing a little, because last school year Little Z only had two days of class per week, so I got a breather in between days I needed to bring snack. Her current class is Monday through Thursday, so I needed to plan and prep four classroom snacks that week, with no days off in between! But after hearing from her other teachers about the class snacks I brought for the gingerbread man unit and her birthday week, plus the Teacher Appreciation lunches I sent for all the teachers last year, her teacher told me she was really looking forward to see what I came up with this year. Doh! This would be the first time all school-year that Z was able to have the same snack as everyone else, since I've been packing dye-free (and now gluten-free) snacks for her every day. On the first day, when I told her what I had put together, she said "Oh yes! 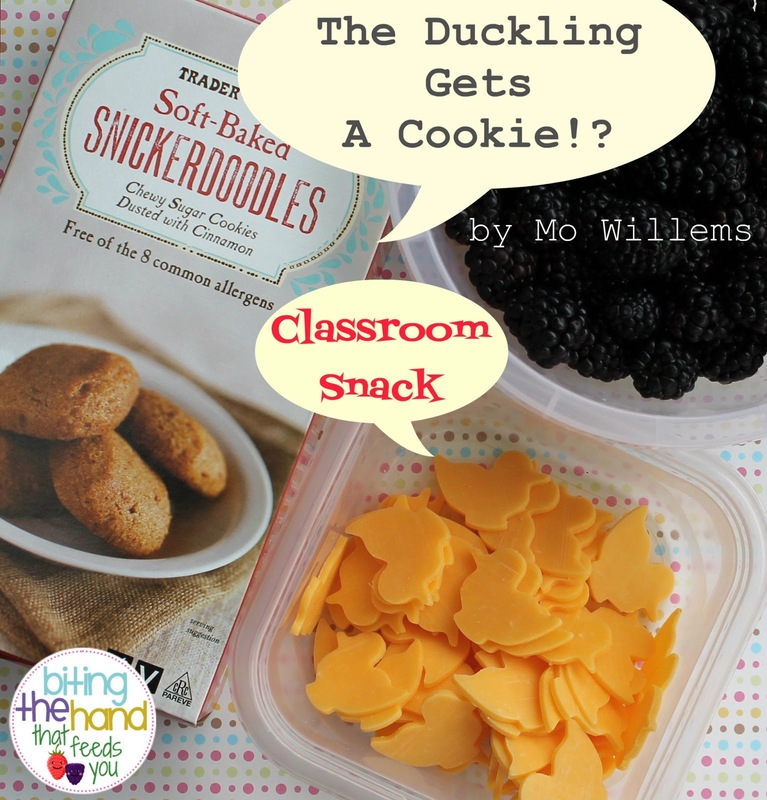 Duckling and cookies for me! And the other kids can have blackberries and something else..." Hahaha! She was actually kind of miffed that her snack wouldn't be "special" and different than everyone else's! ...Gets A Cookie!? : I had thought about making my own gluten-free cookies, since I had seen some fun recipes where you sneak beans or beets in, but in the end I decided to be lazy, and bought several boxes of Top-8-Allergen-(and Gluten)-Free Snickerdoodles cookies from Trader Joe's. I wanted something a bit healthier to help fill them up too, so they wouldn't all be asking for more cookies, so I sent some yummy blackberries as well. Once she had gotten the hang of having the same snack as everyone else, Z was very excited about her Elephant and Piggie snack. Since nobody wants to be doling out 3 hams and 3 cheeses to each kid from a big pile, I chose to pre-pack them in muffin cups, which I then stacked in a reusable container to sit in the classroom fridge until snack time. I opted for foil baking cups instead of pretty paper ones because the ham was moist, and I was worried about the dyes from the paper ones soaking through. Cracker Stackers: We picked out some gluten-free Savory Thin Crackers from Trader Joe's for the kids to stack their ham and cheese on. Or just eat. Since I sent two packages, which was way more than they would need for 60 ham and cheeses, I'm assuming they went over well. Plus some organic apple slices for good measure. Clever! I love the photos in this post too! Nice work Momma!